Colocation Sacramento !! Read this review before contacting any other Sacramento Colocation providers. 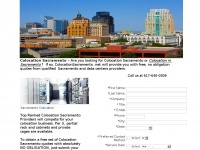 The Colofinders are a nationwide provider of server colocation Sacramento services. The web server used by Colocationsacramento.net is located near the city of Boston, USA and is run by IC2NET. This web server runs a few other websites, mostly in the english language. The websites were created using the programming language PHP and they are hosted on a Apache server, which runs on the operating system Ubuntu (Linux). The markup language of the website is HTML 4.01 Transitional. The website does not specify details about the inclusion of its content in search engines. For this reason the content will be included by search engines.